Quality transport and a reliable travelling option is what each of us eagerly demands. We live in an era where the world and every individual in it is moving on a quick pace. From the second the day breaks to the time when night falls, we are busy and moving from work to schools to a better job opportunity.We are searching and always on the go for our monetary needs, for travelling needs and for social requirements. To make our travelling easier, there are many businesses who have stepped up in the transport industry to deliver exclusive services and who have offered us advance ways of travelling. We have seen many remarkable names in the industry who have introduced newest features and travelling deals for the comfort of the people along with affordability and reliability. It is not easy to satisfy every customer that comes to your store. However, customer satisfaction can mean a lot for the customer and the owner himself, as it can determine if the customer will be willing to pay to the store and request its services again. It ensures and strengthens your relation with the client, which is extremely beneficial. 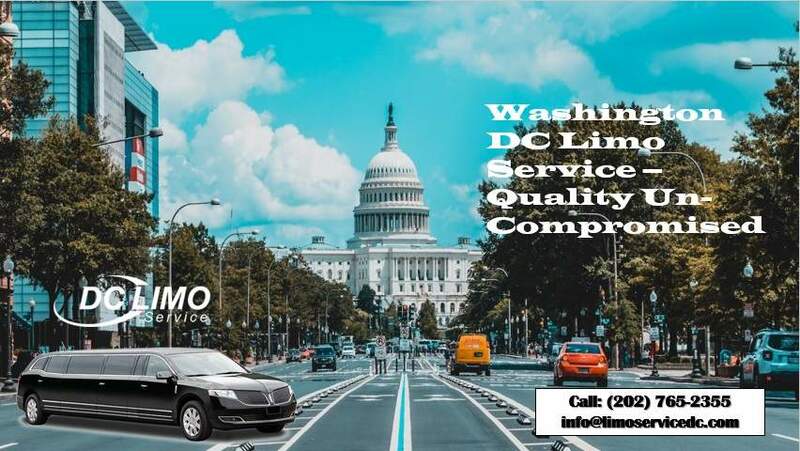 Washington DC Limo Service is working on the same policy for years they have been in business. The services we offer are highly customized for our customers so that they enjoy the benefits and services again and again. We welcome first time customers as enthusiastically as we welcome our loyal and regular customers. Our services include travelling options that are reliable, reasonable and systematic; offering a transport service for clients who are working in offices and on a corporate level, events and occasions, group rentals, weddings and more. Washington DC Limo Service is a travelling plan that many clients opt for. From weddings to corporate services in the town, we offer the Limousine services to customers of all levels. Our clients are well versed that the services we provide are not time bound. We work 24/7 in the offices to provide quality transport for anyone in need. Our helpline services and customer care support team works through the nights to provide quality vehicles to customers. Our team is recruited through a standard procedure, picking out the most diligent and compassionate people in the team. We train them hard to fully understand the requirements and needs of our customers, to know the various facilities we provide, to be courteous and active and more than willing to help clients and more. At Washington DC Limo Service, our vehicle fleet is designed to help every individual customer. Whether you book our services for 2 clients or 50 passenger coaches for a business meet up. We are sure to grant you with customer service that will immensely satisfy you. We look into the demands and needs of our customers deeply and understand the best of them by fulfilling all the demands. Our services have been ranked by officials and clients to be the best and the latest. Not only this, but Washington DC Limo Service offers a range of vehicles for the travelling clients and customers. We take in consideration the needs of all the levels of clients that request our services. From stretch limo services, ultra luxury limo, coaches, buses, SUV’s and Sedans we offer them all in the best available quality. Our transport services are taken care of regularly and driven by chauffeurs that have earned corporate licenses and are well trained on the job and behind the wheel. Our vehicles are latest models and inspected regularly, they are kept clean and tidy. The driver is instructed to take care of all the client needs. They are told to be interactive to provide company, to be courteous and hardworking. The goal they practice is to take their clients through a safest and quickest route to their destination. They are keen on displaying excellent and well-mannered behavior throughout their time of service. Our services have received accreditation and certifications from the transport services. We have worked to make this transport brand the safest and easiest way for the customers, by incorporating clients from all the levels. Our services charges may be high end, but we deliver quality services in affordable rates. Clients from all over DC have been ordering our services because of the price tags. Our vehicles are all checked regularly and are well maintained. We have full-optioned air conditioned cars with a 2 way radio system to communicate with the driver, a comfortable sitting arrangement that can accommodate as many as 8 passengers in a limousine, privacy for your guests in and out of the limo, music player and stereo system, DVD systems, charging points inside the Limo’s premises and a bar with ranges of drinks and beverages, which you and your guests can sip from every now and then. We have specialized deals that you are sure to benefit from, from discounted rates and packages to affordable deals of the town we offer them all. Get ready to contact us for more details and information about the latest travels packs that we offer. We are sure that you will definitely hire and recommend us for more services in the future. We are always available on our service lines to ensure reliability and deliver excellent services to the fullest. That is why we are here to deliver excellence.